As part of ACT’s Online Mental Health and Autism Project, we will be featuring a dozen new online videos this Fall/Winter season at Autism Videos @ ACT. We are beginning with Professor Christopher Gillberg, a world renowned autism researcher who has developed the concept of ESSENCE, recognizing the overlapping symptoms of ASD, ADHD, Oppositional Defiant Disorder/Conduct Disorder (ODD/CD), anorexia nervosa and other eating disorders, intellectual developmental disorder, communication disorders, dyslexia, epilepsy, cerebral palsy and others. In this thought provoking presentation, Dr. Gillberg makes the case that ESSENCE (Early Symptomatic Syndromes Eliciting Neurodevelopmental Clinical Examinations), are common childhood onset disorders, affecting about 10% of the general population, that can be effectively treated. Early recognition, psychoeducation and other targeted interventions, can improve adaptive outcomes in adult life. This presentation was recorded in 2017 at ACT’s 13th Annual Focus on Research Conference, held at Simon Fraser University in Vancouver, British Columbia. 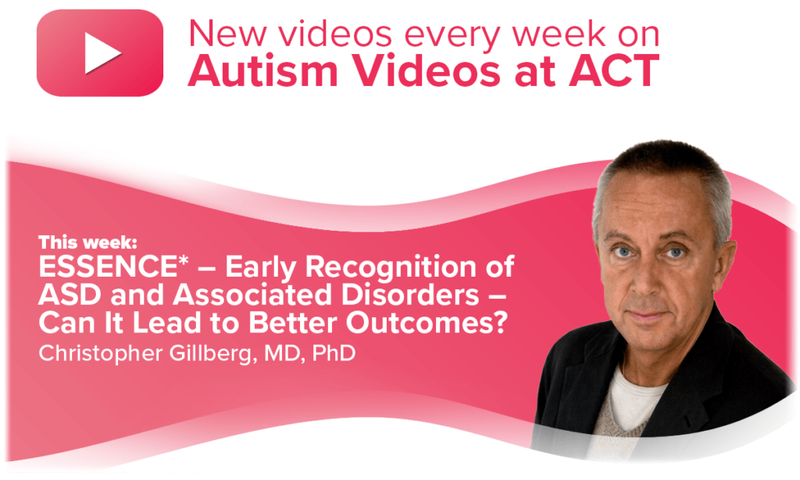 ACT appreciates Dr. Gillberg’s generosity in allowing us to include it as part of Autism Videos @ ACT. ACT will be releasing new videos with a mental health focus every week until the end of December, featuring presentations ACT has recorded as part of the Online Mental Health & Autism Project. Receive updates on new videos by signing up for our email list or use the share buttons on the page to send to a friend or colleague. Addressing Mental Health in Autism: Should We Treat the Person with ASD, the Family, or the Community? This entry was posted in News on September 28, 2018 by ACT.